Germany and Turkey share a long-standing migration history that predates the signing of a formal labor recruitment agreement in 1961. Yet the “guest workers” recruited at that time composed the first large-scale flows from Turkey to Germany, paving the way for the greater numbers of migrants to come. In German media and on the political stage, migration of Turkish nationals has been the subject of much controversy and debate. Some European policymakers, for example, have expressed concern that migration inflows would grow if Turkey were to accede to the European Union (EU). More recently, concerns have arisen about “brain drain”—specifically, the loss of skilled workers with a migrant background—as, the number of migrants leaving Germany for Turkey has outnumbered those entering since 2006. Migration of nationals along the Germany-Turkey corridor still occurs in both directions, however, and cannot be defined by just one type of movement. Today’s Turkish and German migrants travel well-trod paths between the two countries, and include highly qualified Turks who move from Germany to Turkey or come to Germany for short-term stays through intracompany transfers, as well as German retirees spending their holidays in Turkey. 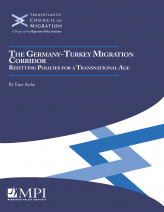 This Transatlantic Council on Migration report describes how German-Turkish migration has developed over recent decades; examines the economic, social, and political factors behind this development; and discusses the policy implications and lessons that can be drawn. Who is moving, and why? How have the labor market, German immigration policy, and Turkish diaspora policy affected (or been affected by) migration movements of nationals between the two countries? What could both countries do to take better advantage of the unique resources of this transnational population? B. Integration Policies: A Need to Modernize?